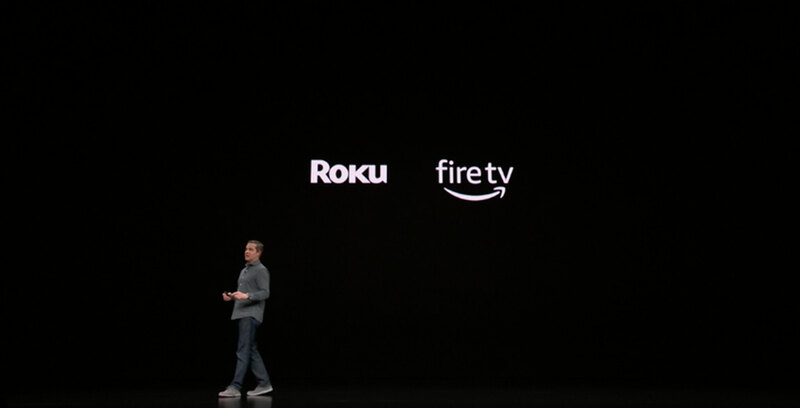 During Apple’s ‘Show Time’ event at the Steve Jobs Theatre, the company announced that its new Apple TV app will be available on Roku and Fire TV devices, plus a handful of smart TVs. The new app is full of new features, and besides being available on all of Apple devices, like Apple TV 4K, the iPhone and iPad, it’s also coming to Samsung, LG, Sony and Vizio smart TVs. It’s launching on Samsung’s TVs first this spring, but there’s no specific timeline for when the app is coming to the rest of the platforms. Apple’s new streaming platform Apple TV+ is launching in the fall, so ideally the app will launch on these platforms before then. This news lines up with Apple partnering with these TV manufactures to allow AirPlay 2 and iTunes on their smart TVs. AirPlay 2 allows Apple device users to stream content from the streaming service to these televisions. This is a big move for Apple who typically keeps its services within its own hardware ecosystem. The first app to make it off of Apple’s devices was Apple Music which launched in June of 2015 on iOS and was followed a few months later by an Android version. More recently, it was added the Amazon’s Alexa ecosystem in the U.S. Pushing out the new TV app to more platforms continues this trend and shows that Apple is committed to its media services and not just using them to sell more Apple products.